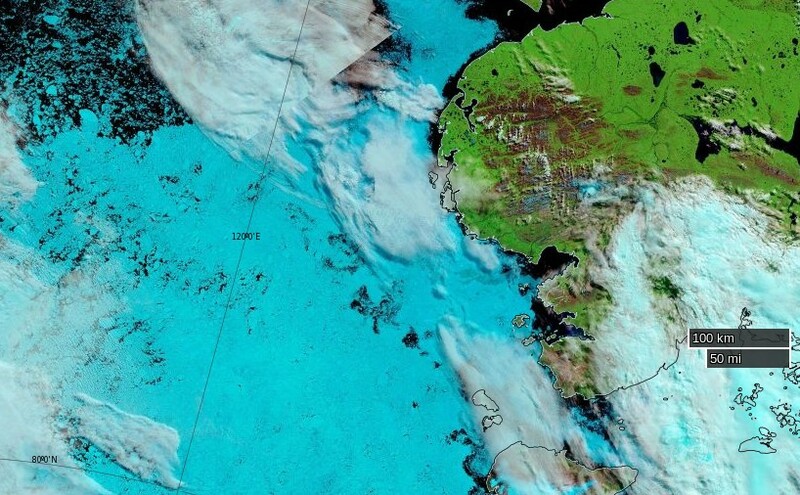 There has been very little melt going on in the Arctic Ocean the last few days, due to cold cloudy weather. 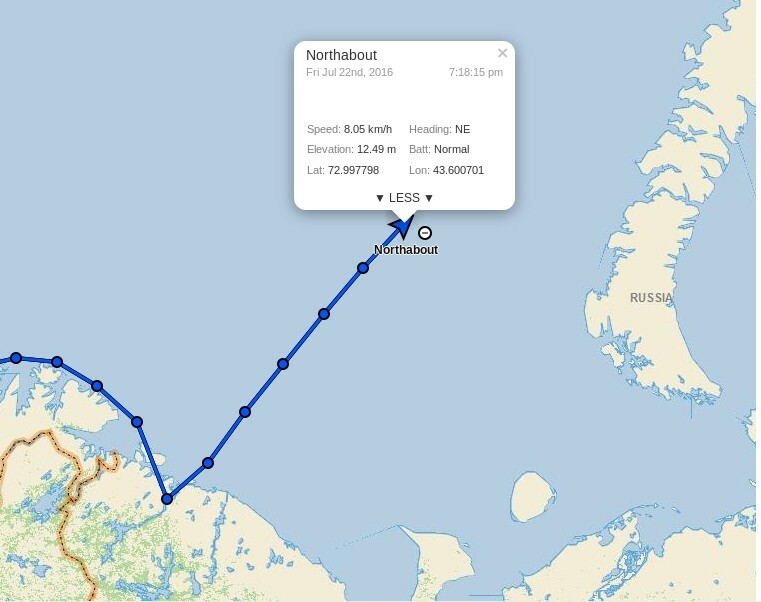 A group of climate clowns were planning on sailing around the entire Arctic Ocean through the Northeast and Northwest Passages (to prove there isn’t any ice in the Arctic) but are stuck in Murmansk because the Northeast Passage is completely blocked with ice. David is one of the most experienced and successful adventurers in the world. Do you suppose Tony Heller suffers from precognitive dreams? Sea and air temperature getting colder as we venture further north. Saw quite a lot of Dolphins for the first time around the Yacht. Still sea gulls flying behind and skimming the waves. Had some promising Canadian ice charts yesterday, but that’s a long way off. Today we should get an update with the Russian side. 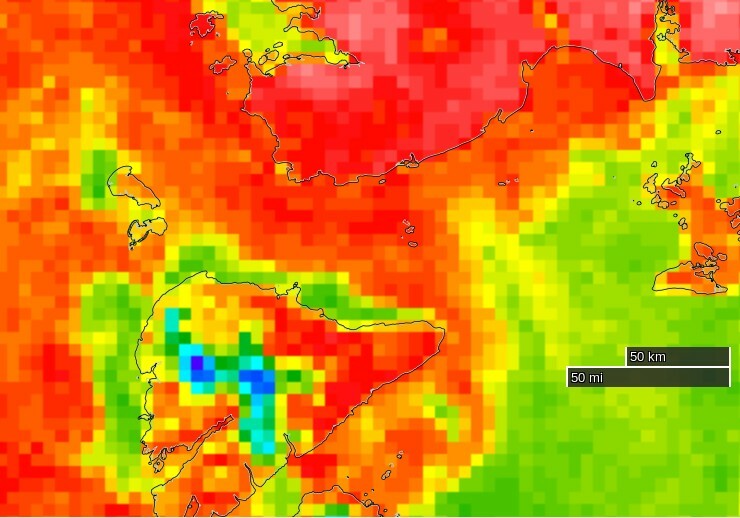 fingers crossed it is still not solid around the cape and Laptev sea. That could slow us down considerably. The wind has been blowing the pack ice against the land, so very difficult to get around the shore, but let’s see what Santa brings. The Polar Ocean Challenge is headed off into the ice. They will run into this in three days – hundreds of miles of solid ice. Without an icebreaker, they are going nowhere. I asked them on Twitter if they have an icebreaker. I haven’t received a response, and will be monitoring them by satellite to see if they are cheating. 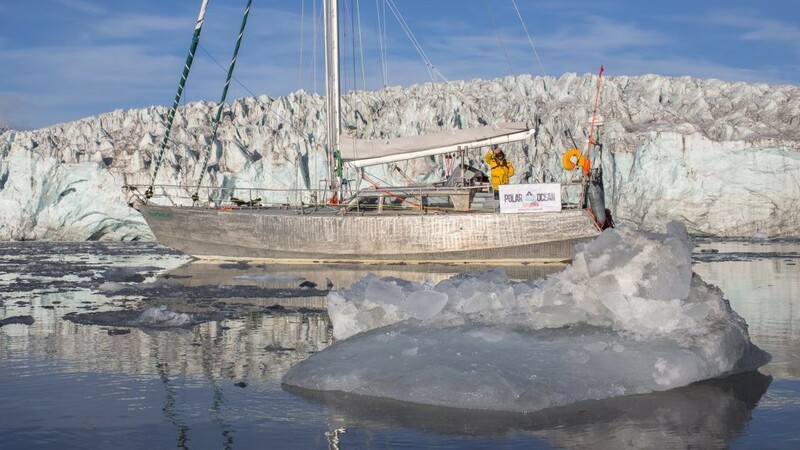 As for ice melt, yet another totalitarian propaganda expedition intended to “raise awareness” of climate “catastrophe” by trying to sail around the Arctic in the summer has just come a cropper owing to – er – too much ice. Neither the North-East Passage nor the North-West Passage is open, so the expedition is holed up in – of all ghastly places – Murmansk. That’ll teach Them. Even if the ice disappears for a week or two so what? The same was quite possibly true in the 1920s and 1930s, which were warmer than today in the northern hemisphere, but there were no satellites to tell us about it. The Good Lord seems to have a very tenuous grasp on reality, since the NSIDC’s graph shows nothing of the sort. Perhaps he is merely indulging in irony? I just wore a T-shirt on my first watch out of Murmansk. Today I wore my trawler suit and a primaloft under it with gloves and a hat…. 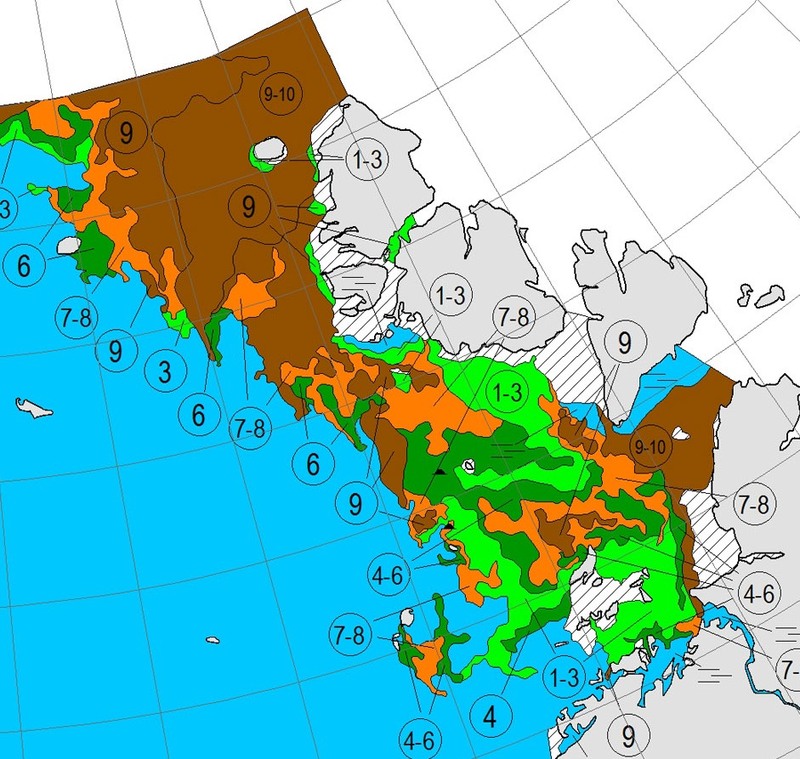 Partly checked the new ice charts on www.nsra.ru, we still have no chance of getting through yet, not past the cape or through the Laptev sea. 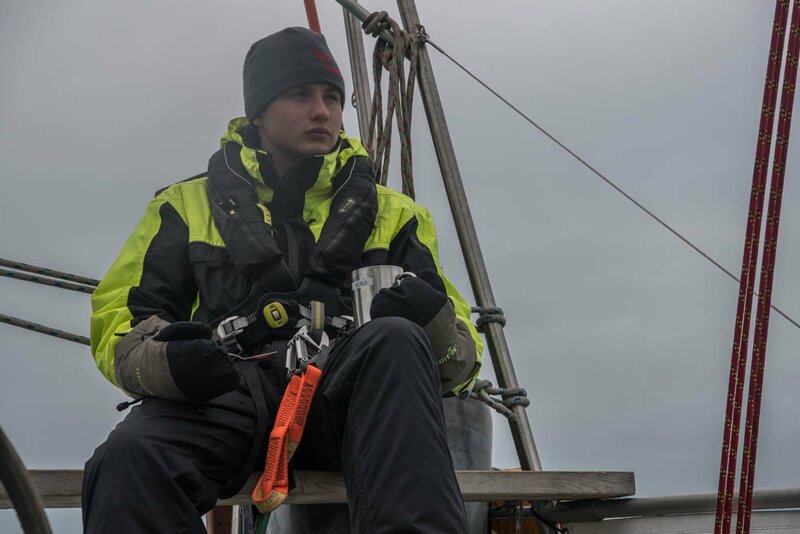 Nikolai, Our Russian Captain who is very familiar with this route, impresses on me that this is a very unusual year and normally clear, Not what I want to hear. We are under sail, so saving fuel, and will find a small island to shelter until we get improvements. We are still 5 days from the ice, so lets hope for some southerly winds to push the ice from shore. Choppy sea, taking four hour tacks. 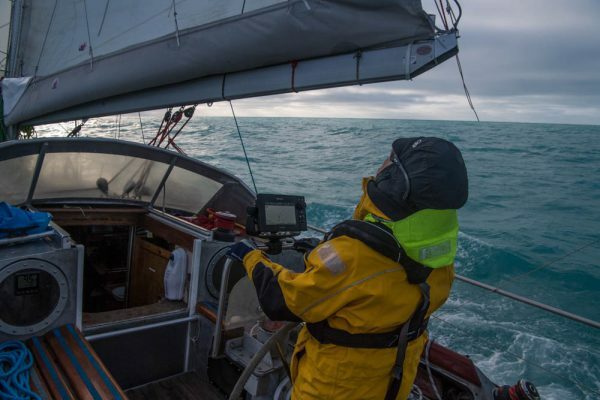 These sea conditions make it hard to sleep, cook or relax. We are considering many elements all the time. 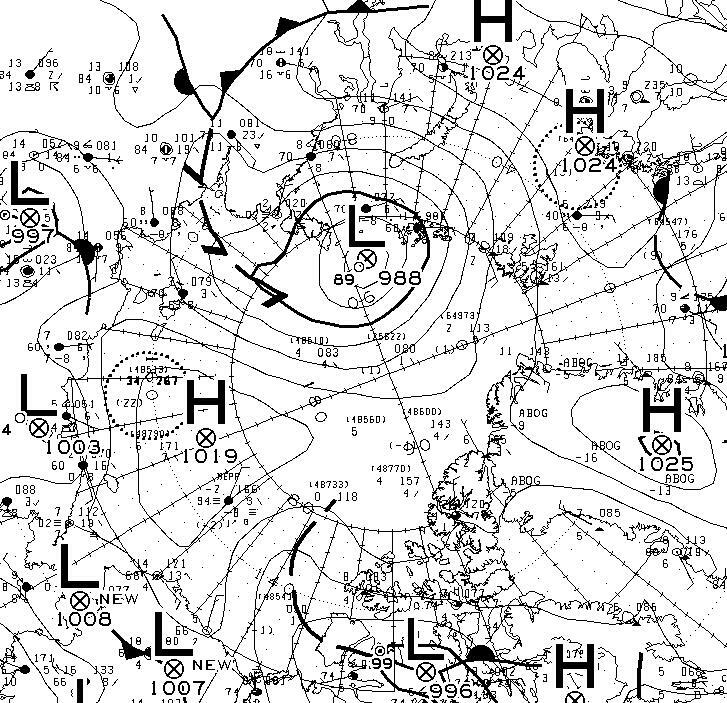 We are due new Russian Ice charts today. 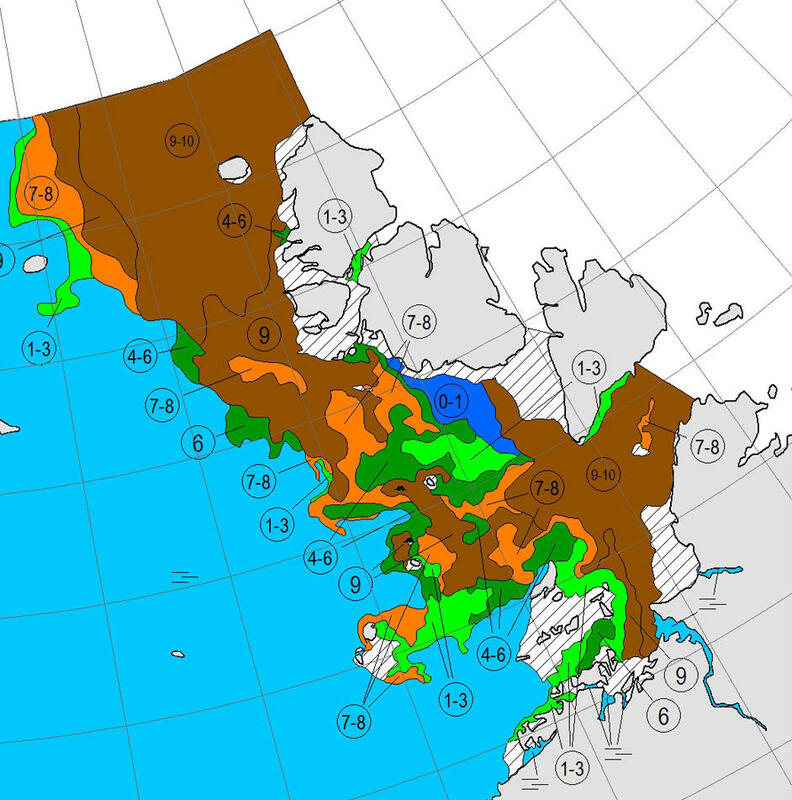 We know the North west is pretty clear, but this year is a very unusual year in the north east passage. 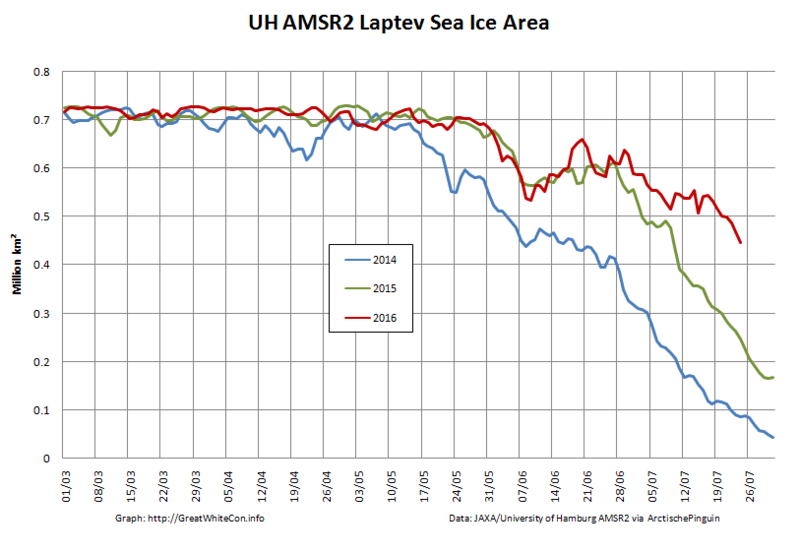 Normally the Laptev Sea would be pretty open now as in previous years. It is not. 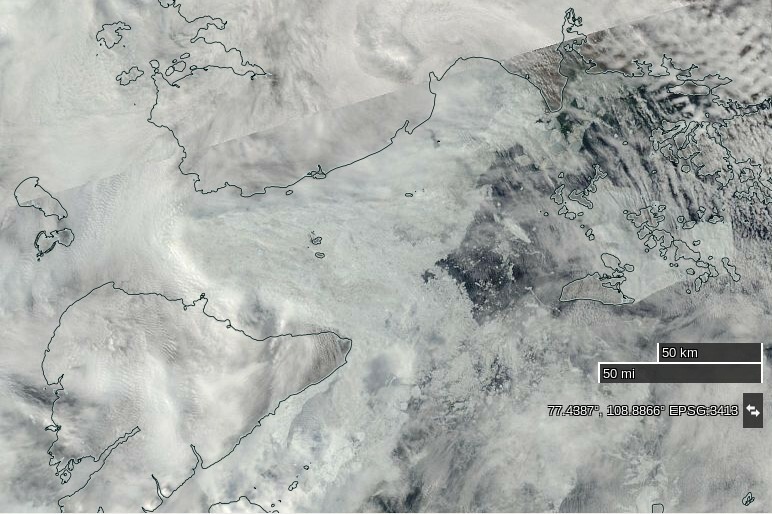 This is also partly due to the wind blowing the pack ice down south and consolidating next to the land. So, we need to get through the straight and through the Laptev Sea. So where do we wait until we can do this? We have deliberately taken our time to get to this point, and used the wind as much as we can to conserve fuel. Now the weather has changed, the wind direction has also changed. From the calm turquoise seas, to choppy short seas, wet, windy and cold. The other options are to Heave to and wait, but this is a sailing Yacht, she needs to sail. And if we get a Southerly blow, it could change our chances very quickly to get around, so we need to be close to react. So, another day at the office. 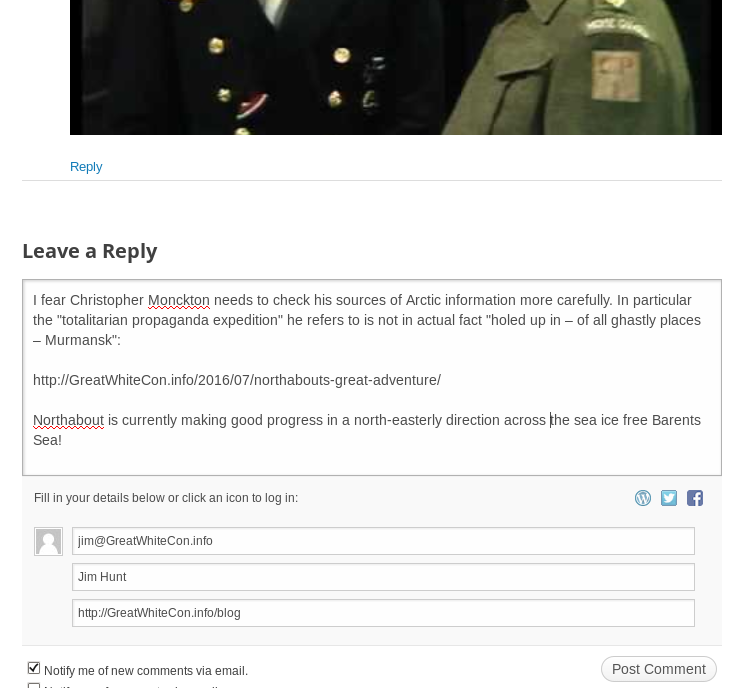 I thought that I’d read somewhere that [Northabout] had got stuck. I cannot help but wonder what on Earth gave him that idea? It’s not exactly plain sailing there either just yet! When the word “scepticism” is preceded by the term “climate change”, this becomes a contender for the “Best Example of an Oxymoron” award. It seems there is a real battle to determine who is best equipped to put the “moron” into oxymoron. Quite so! Messrs Monckton and Heller are neck and neck at the front of the field just at the moment, but I have high confidence that Anthony Watts will be snapping at their heels real soon now. 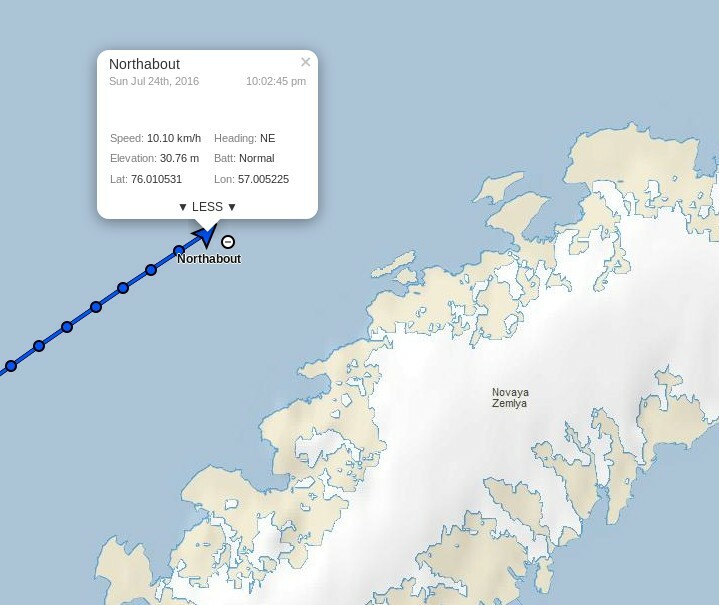 Amundsen’s route through the Northwest Passage looks like it will open up particularly early this year. Perhaps a last minute decision to circumnavigate in a clockwise direction would have worked out better? Has been clear this time of year for the last 2 years,Eli. It wasn’t clear even in July 2012! I just remember big holes opening up on that side early the last 2 years. Do they have to sail through the straight? 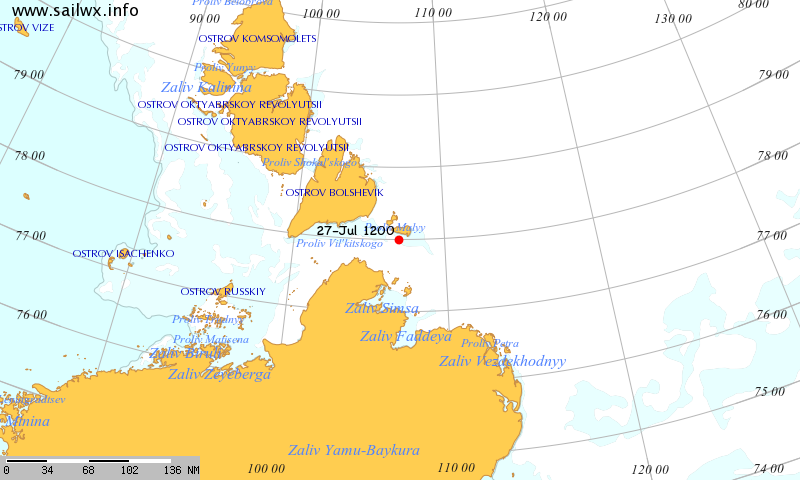 Some years the ice north of Severnaya Zemlya clears before the Vilkitsky Strait. Check the 2014 video again! I rather doubt that will happen this year though, but never say never in the Arctic. 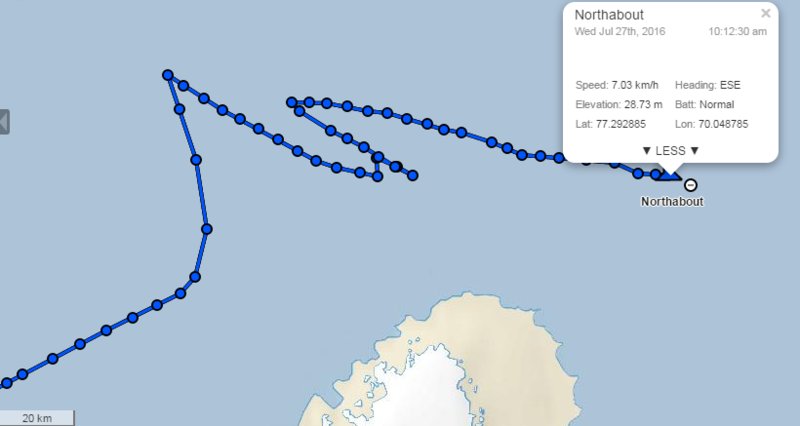 I’ve just looked at the Polar Ocean Challenge live tracker, and the vessel has already gone past 72E. Wonder when they’ll expect to get to near the longitude of the Nordenskiöld Archipelago at approx 95E? 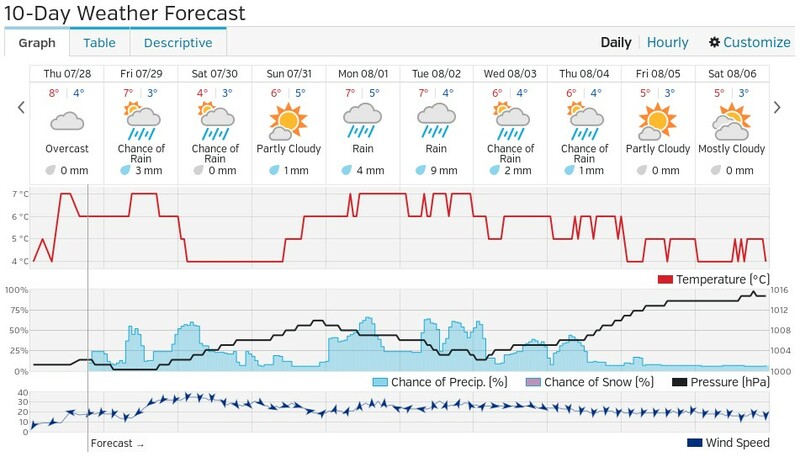 Assuming I can still do some maths – big assumption – each degree of longitude at their current latitude of around 77N is a tad less than 16 miles. 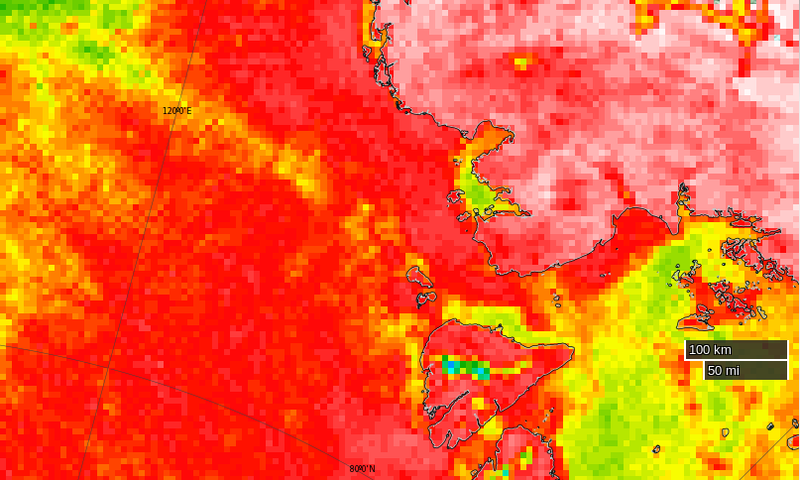 However last time I looked there was still fast ice in the Nordenskiöld Archipelago? See UH AMSR2 above. Not currently a brilliant place to wait for an opportunity at the Strait? Well, that’s 74E been and gone. I suppose there’s a mini-milestone coming up soon when they get to 90E, as that would represent the 1st quarter of the circumnavigation. Although, as the point of departure was Bristol, 90 degrees east of that would actually be at 87 deg 25′ East. The ice around Nordenskiöld Archipelago poses an interesting route choice: do they skirt it to the north or the south? 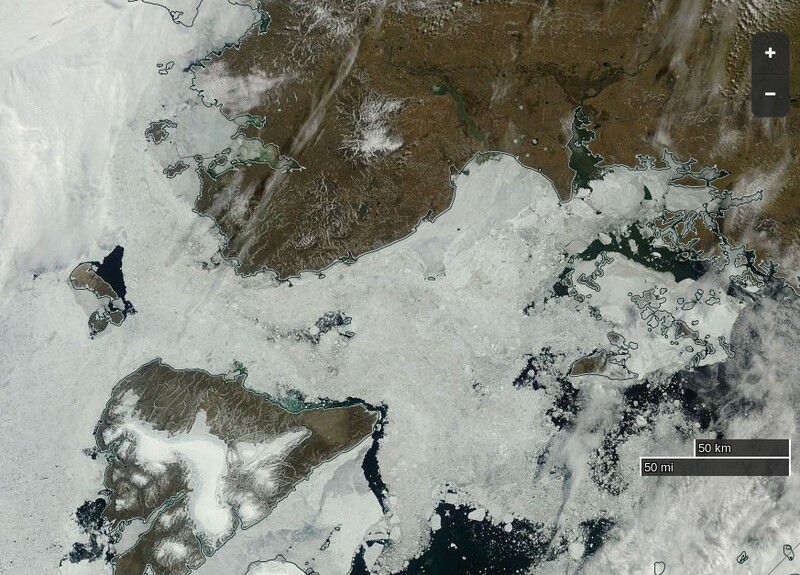 North is probably shorter, but the southern side seems to be effectively ice free. 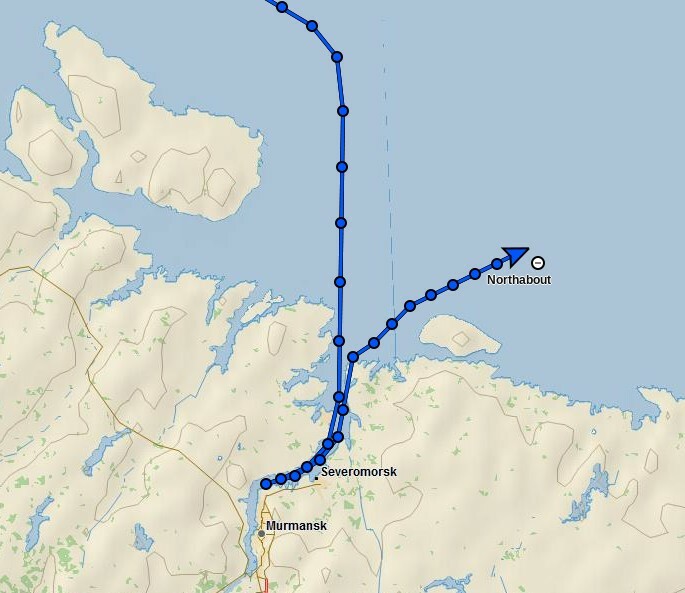 Always assuming Northabout makes it through Vilkitsky Strait in time! 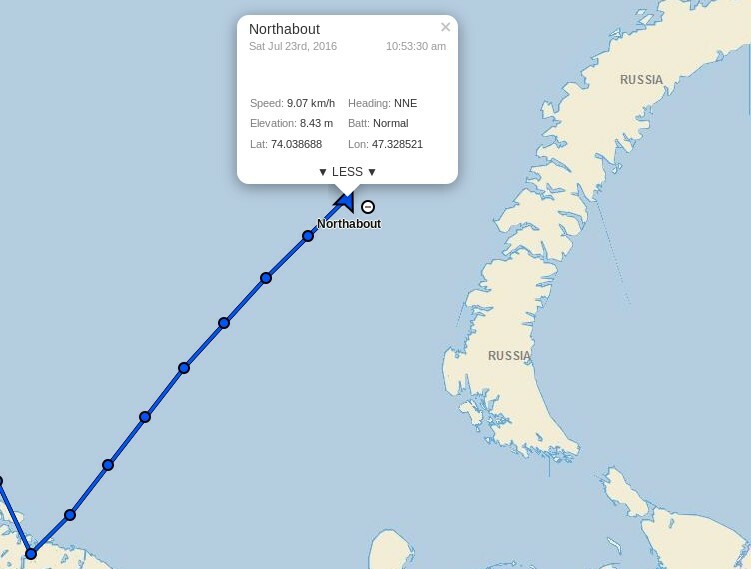 Børge Ousland in “Northern Passage” made it into the Laptev Sea on August 15th 2010. Going by those dates Northabout is currently well ahead of schedule! Ha! The title of that little video clip effectively explains how the Motor City got its name. I see there has been another of those “weird” course changes (from a SE bearing to NNW) over the last hour or two, so Northabout is still just shy of 79E. there appears, to my untutored eyes at least, to be the beginnings of a “clear-ish” channel extending a considerable distance eastward from the southern shores of Bolshevik Island. Would you interpret it in the same way? I would indeed Bill. 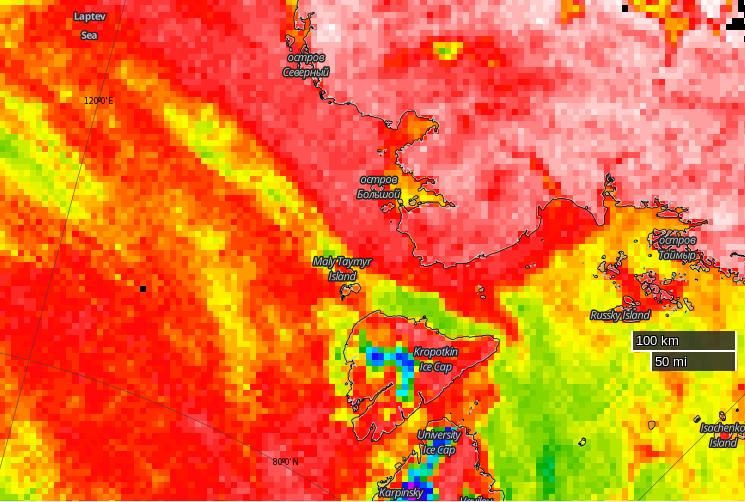 See also today’s visual imagery above. Jim, Northabout reached about 6W whilst rounding the Scottish Isles, and is currently approaching 85E. One could therefore say that this represents the completion of the first quarter of the planned circumnavigation. Have you seen the animation that Wip posted earlier today on the ASIF Home Brew AMSR2 thread (#2453)? 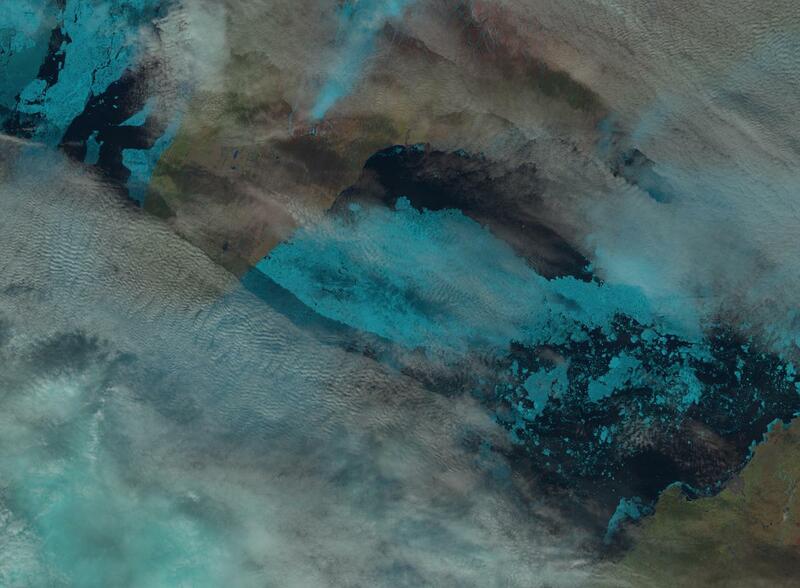 This shows the quite frightening degradation of ice around the Nordenskiöld Archipelago, through the Vilkitsky Strait and beyond into the Laptev that has occurred over the last two weeks. 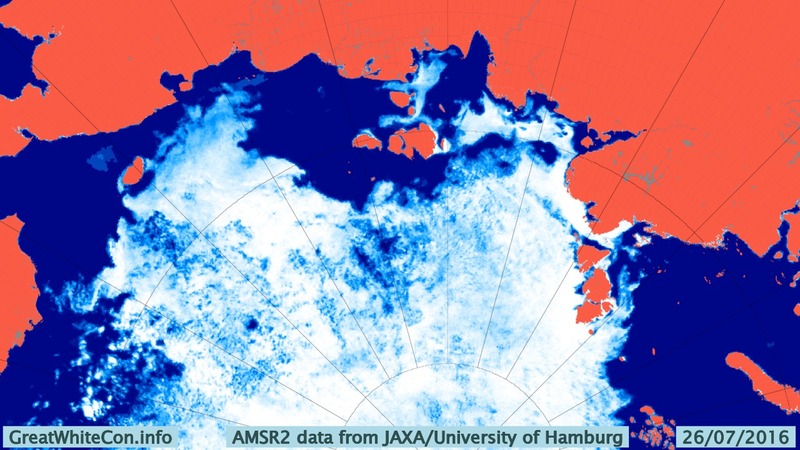 Polar Ocean Challenge in trouble. Too much Arctic ice. svalbard-day2-16th-0924-2On June 19th 2016, the Polar Ocean Challenge expedition left Bristol in the boat Northabout to circumnavigate the North Pole anticlockwise. 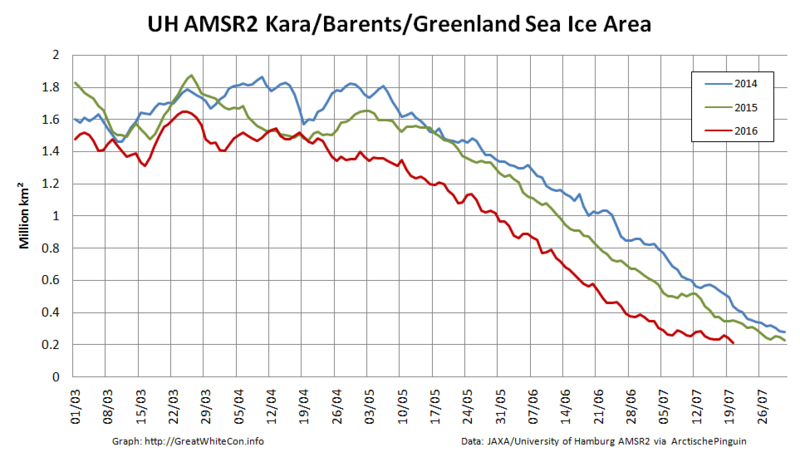 By doing this they hoped to demonstrate that the Arctic sea ice coverage shrinks back so far now in the summer months that sea that was permanently locked up now can allow passage through. 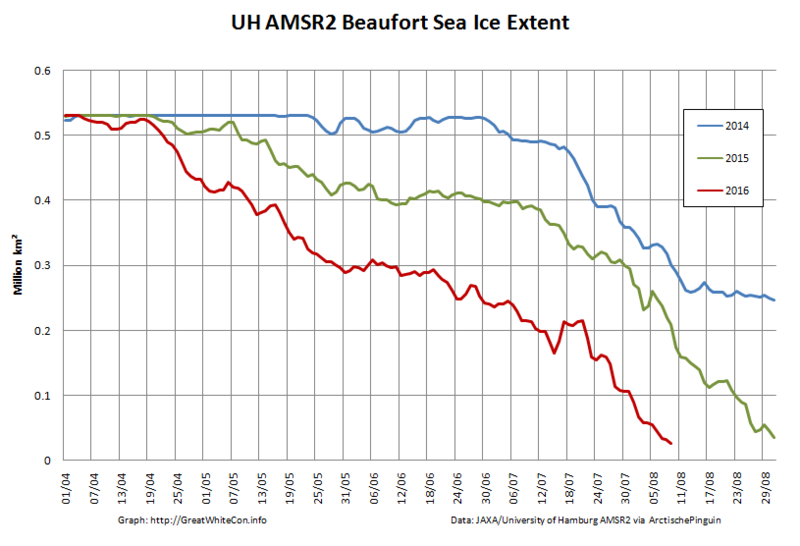 Permanent irreversible change in the sea ice landscape of the Arctic seems to them inevitable. This will / is already having global economic political, social and environmental implications. The goal seems lofty and idealistic enough. There is only one major problem. 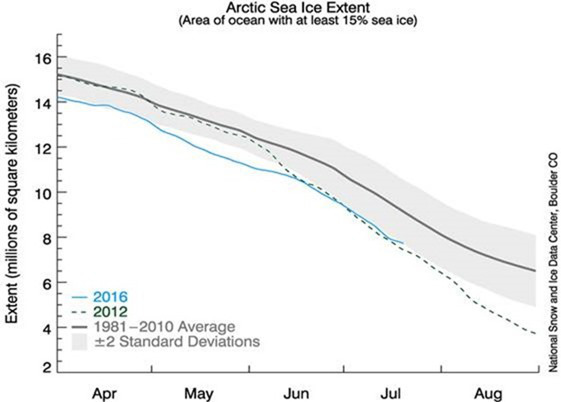 The Arctic Ice Cap isn’t cooperating. Let us take a look at the polar ice cap on Aug 6, 2015. 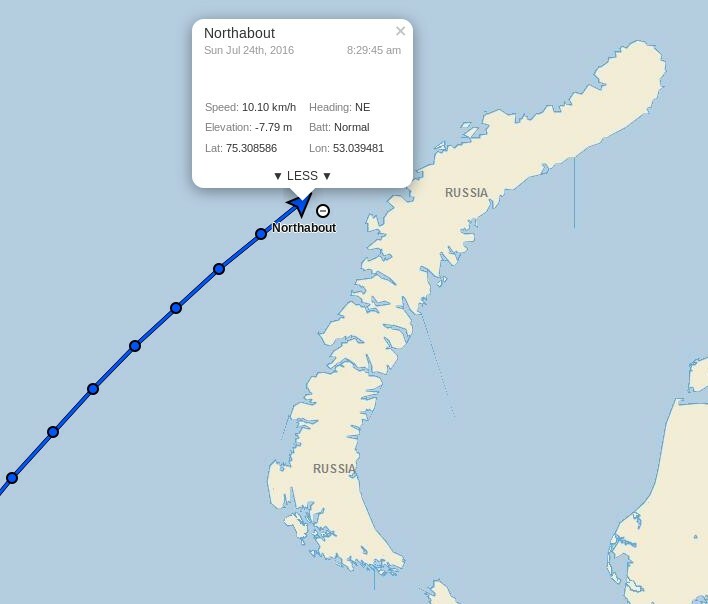 The North East Passage was open for clear sailing the whole Russian coastline and they planned to go through the North East Passage ice choke point, Cape Chelyuskin on or about Aug 5. 2016. It is now Aug 8, and the boat is huddling in a sheltered cove waiting for the ice to melt. Taking a look at the Arctic ice cap for Aug 6, 2016. There seems to be a lot of melting left to be done before they can pass through the choke point. How bad is it? 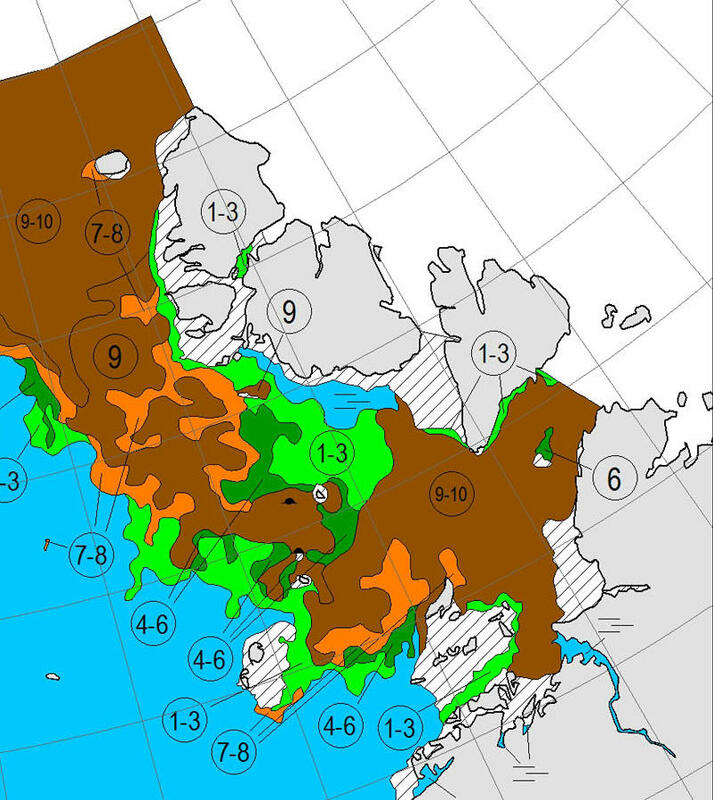 The total Arctic ice volume on Aug 6 last year was around 6250 cubic kilometre. This year the volume on Aug 6 was about 8000 km3, a year to year increase of about 28%. The ice volume is now very close to the 30 year average. Reality has a way of getting in the way of the best laid plans and the most ambitious climate models. 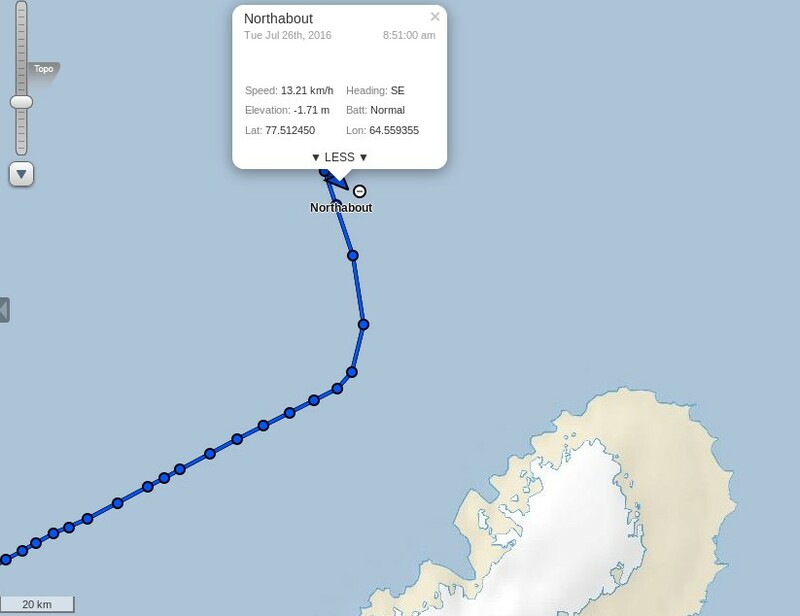 Update: Looking at the tracker, Northabout seems to have passed Cape Cherlyuskin the afternoon of Aug 9, only 4 days behind schedule. 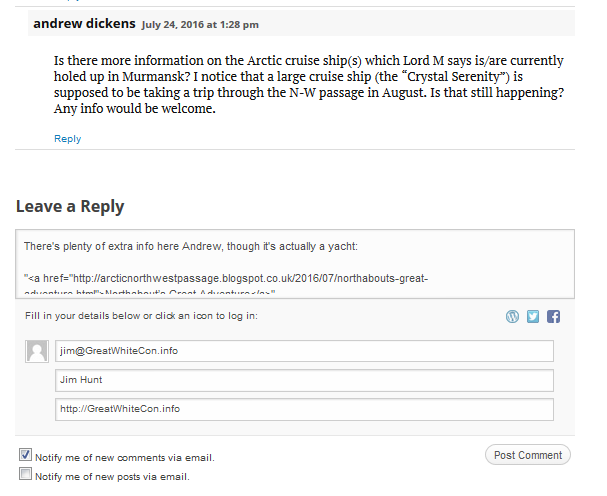 They should be able to sail another 50 miles or so before hitting heavy pack ice. I wonder if you might care to provide a citation for some of your claims? When I look at the chart on the PIOMAS website, the latest 2016 value is approximately 1,000 cubic kms lower than the 2015 equivalent, rather than about 1,750 higher as you claim. This value is about 7,000 cubic kms (or about 45%) lower than the 1979-2015 average for the time of year. To most people, that doesn’t exactly qualify as being “very close to the 30 year average”. Lennart seems to be capable of cutting and pasting erroneous information, but not of checking data. 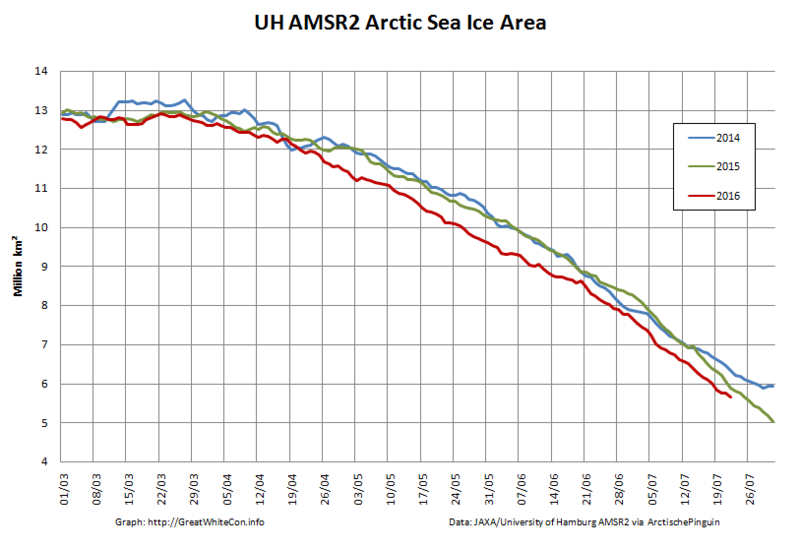 As Bill points out, however you choose to “measure” it Arctic sea ice volume is currently far below “the 30 year average”. 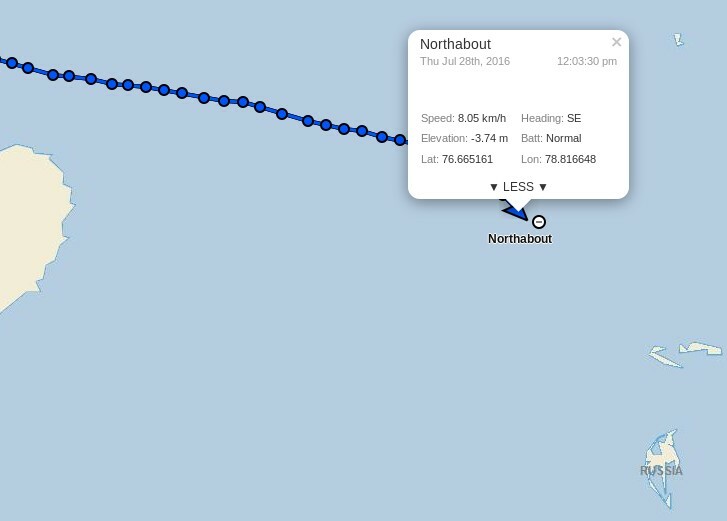 If you bothered to scroll up slightly you would note that previous successful circumnavigations passed Cape Chelyuskin later in August than Northabout.